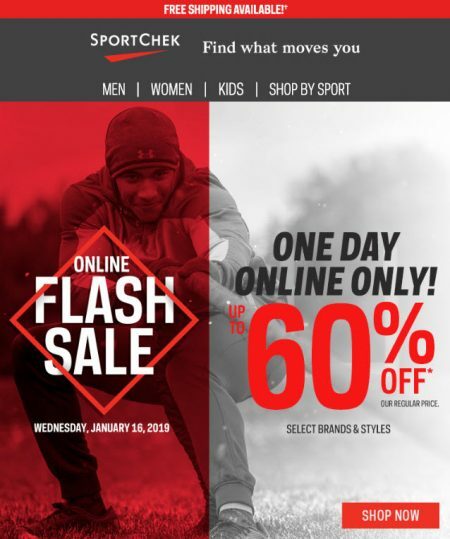 Sport Chek is having a 4-Day Sale! Save up to 50% off the original ticket price on select brands & styles. I browsed around and there’s currently 93 items on sale. The 4-day sale runs from February 15-18, 2019. 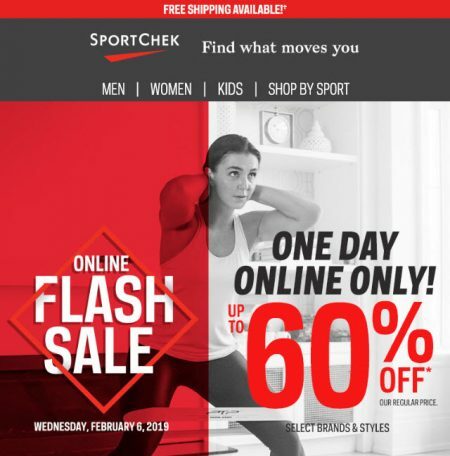 SportChek.ca offers free shipping on orders over $50. 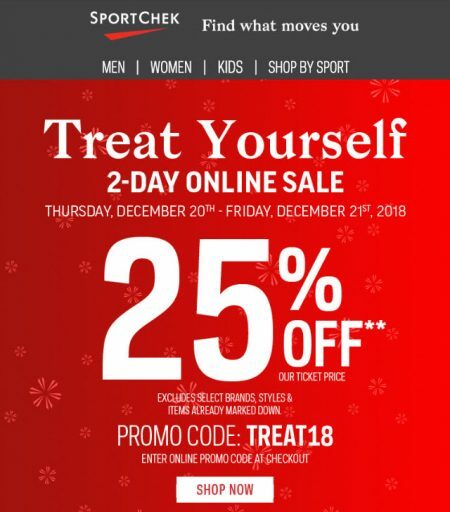 Sport Chek is having a 2 Days Only Sale! Take 30% off on Shoes & Clothing + free shipping on all orders when you enter promotional code FC19SALE at checkout! Excludes select brands, styles & items already marked down. The sale is available for 2-days from Friday, January 18th to Saturday, January 19, 2019. 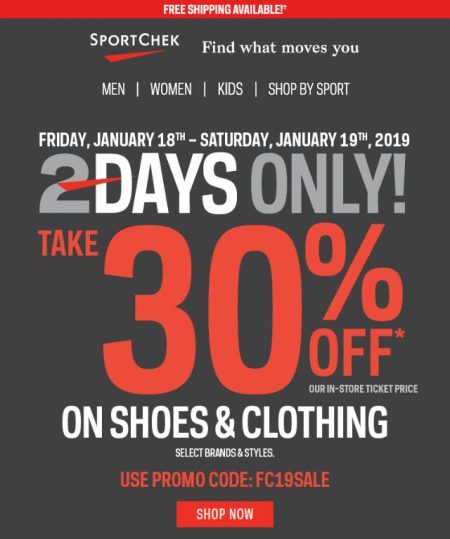 ONLINE: Enter promotional code FC19SALE at checkout to take 30% Off* our ticket price on shoes & clothing. Free shipping credit¹ available. IN-STORE: Bring qualified items to the till to take 30% Off* our ticket price. 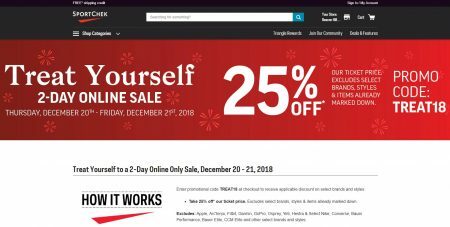 Excludes: Arc’teryx, The North Face, Icebreaker, Footjoy, Spyder, Pajar, select adidas, Nike, Bogs, Sorel, Timberland, Ugg, Vans & other select brands, styles, items on sale and already marked down. Valid from Friday, January 18th – Saturday, January 19th, 2019 end of day. Hurry, the sale is available online-only on Wednesday, January 16, 2019 or while supplies last. Shop early for the best selection of sizes and styles. Hurry, the sale is available online-only on Wednesday, January 9, 2019 or while supplies last. Shop early for the best selection of sizes and styles. 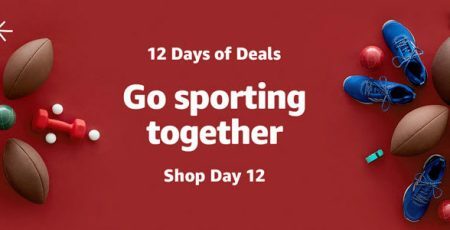 Sport Chek has started their Boxing Week Sale early! Save 20% to 60% off the original ticket price storewide + free shipping on all orders! Select brands & styles. The week long sale runs from December 24-30, 2018. Boxing Day Deals up to 60% Off our regular price & More Great Deals. Boxing Week Storewide 20% – 60% Off* our original ticket price. Excludes items ending in .88. Select brands and styles. Online order must be completed by December 31st, 2018 1:59 AM ET to qualify. SportChek.ca is currently offering free shipping on most orders during this sale. The sale is available online only for 2-days and will expire on Friday, December 21, 2018. 20% off ALL BOZ Fruit Infuser Bottles a healthy stocking stuffer!